Having just recently posted an article on online file sychronization services Dropbox and OpenDrive and mentioned similar services SpiderOak and Syncplicity, the one most eagerly awaited has arrived - Windows Live Live Mesh. Part of the excellent Windows Live service, Live Mesh allows you to synchronize files and folders across different machines, share those folders or collaborate with others on them and even access remote machines directly. 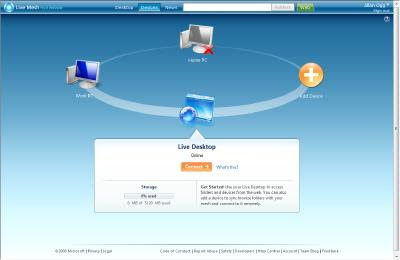 As part of the service you get 5Gb of online storage for free and that is presented to you as your Live Mesh Desktop, which is accessible from any web browser. As for the synchronization part, Microsoft currently only have client software for Windows XP and Vista but they are working on clients for Mac OS X and Windows Mobile. Currently, if you have a Windows Mobile device, or any phone that supports file system access, then you can upload files to your Live Mesh storage over the web via m.mesh.com. Live Mesh is a bit more configurable than the others in that you can choose which files and folders are synchronized with which device so you can be a bit more choosy as to who gets access to what files. Like the others you can allow other people to access and even modify the contents of a Live Mesh folder so you can publish or collaborate with ease. You're also not tied down to a single folder from which to sync or share things out from. All you do is right-click on any file or folder and select the Add to Live Mesh option to get started. PS That 5Gb of space doesn't seem to be a part of the 5Gb you get Windows Live SkyDrive so enjoy the extra free storage, courtesy of Microsoft.